Roy Keane takes part in a Republic of Ireland training session ahead of the Euro 2016 opener against Sweden. Roy Keane will not be repeating his famous walk-out from the Republic of Ireland camp of 2002 despite his bed at the team’s Euro 2016 base being too soft. The former national team skipper flew home from the 2002 World Cup finals 14 years ago without kicking a ball in protest at the facilities on offer at their base on the Pacific island of Saipan, but he has no such complaints this time around. Speaking at the Republic’s training camp in Versailles ahead of Monday night’s Group E opener against Sweden, Keane said: “The facilities are brilliant – they’re a credit to everyone in the set-up here; the training pitch, the hotel, the location. “It’s been fantastic and so far the welcome that we have had where we are staying with the staff, the food, we’re delighted. Heightened security around the tournament means armed guards are patrolling the team hotel, which is strictly off limits to media and fans. However, 44-year-old Keane insists their presence is far from intrusive. He said: “No, it’s not really affected me. But these are good security guys – they are not in your face, they are not lying at the end of your bed, it’s just around the hotel and they are very discreet and that’s why they are very good at their jobs. Keane and manager Martin O’Neill have agreed, along with the rest of the coaching staff, to extend their stay with the Republic to take in the next World Cup qualifying campaign. However, the former Manchester United midfielder remains intent on returning to club management one day. Keane, who has been courted by Celtic in the recent past, said: “I said all along that I had to wait to see what the manager’s plans were. “Things fell into place the last few days and he has decided to stay on. He wanted me to be part of it and I didn’t really hesitate. “With the club stuff, I’m 44 years of age so there is plenty of time for that. I am keen to get back into it – and when I said short term, I mean in the next few years, not the next few weeks. “I’m happy to stay on. I’ve really enjoyed the job with the manager, the staff, the players and the FAI. It has been really enjoyable. 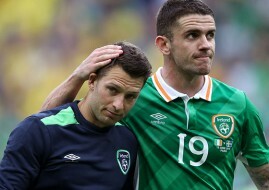 Asked if he was worried that the offers might dry up the longer he was out of the club game, Keane said: “No. I’m pretty confident in what I’m trying to do and working with the Irish team is a pretty good job. Actually, it’s a brilliant job and I’ve really enjoyed it. But questioned about the presence or otherwise of an escape clause in his new contract, he was less than forthcoming.